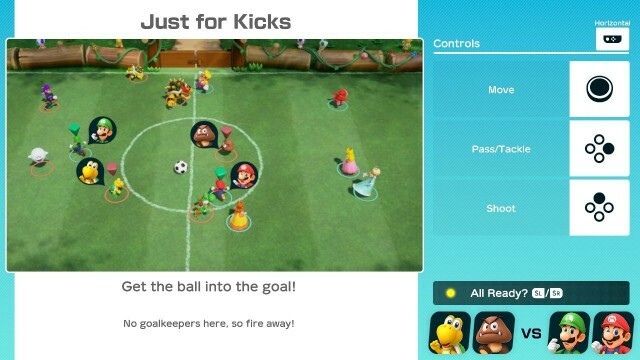 "Just for Kicks" is a soccer mini-game in Super Mario Party that is one of the best and most fun mini-games included. It looks like this is all we will get in terms of Mario soccer action for now, unless Nintendo decides to rehash the Mario Strikers series for the Switch! How do you play this soccer mini-game? You control your selected character by using the control stick. Press the "up" button to shoot the ball, if you hold the button down you get a slightly more powerful shot. The "right" button allows you to pass the ball when you have possession of it. When you don't have the ball, it becomes a tackle button and you can take down an opponent briefly. One thing to note is that, you are unable to "change" players on the field, so your selected character will be the only one that you can control. The rest of the field will be either be your teammate or computer AI controlled. There are none, no offsides, no goalkeepers, no fouls, just get the ball and go! The downside about this fun little mini-game is that you only get 60 seconds to play... happy footballin'!